Note: The following post was prepared by Brian Heaton, an associate planner with Eureka’s Community Development Department. Chances are that someday you’ll want to do something with your residential property in Eureka. You might want to do a home addition to create your dream kitchen. Maybe you’ll want to build a sweet garage for your classic car collection. Your inner woodworker may yearn for a purpose-built workshop. Perhaps you have a vacant lot where you’d like to build a new home. Maybe you have ambitions to carve off a lot or two from a parcel that you already own. Heck, you might be interested in adding a second unit to your property just because you could use some extra income. When that day does arrive, you’ll have to get in touch with the City Planning Department. Most folks try to head straight to the Building Department, but that’s actually Step 2 in the process. Step 1 is the Planning Department, and that means zoning. Zoning, at its most basic level, is the regulation of use and the size/location of structures on a parcel. The “size/location of structures on a parcel” part is described by a specific term: development standards. Development standards are all of the rules about how large/tall your structure can be and what the minimum setbacks are, in addition to things like number of required parking spaces, landscaping, etc. It gets very specific. We have minimum lengths for parking spaces (19’ or 20’, depending on whether it’s covered), minimum driveway widths (11’), maximum building heights (anywhere from 12’ to 100’, depending on the zone). Together, development standards are like a recipe book for the City. Each zone has its own recipe. The problem is that a lot of Eureka’s recipes aren’t very good. In the example below, you’ll see a two-car detached garage with a second unit above. There are many such examples already existing in Eureka, and this is a frequent request made at the Planning Department. Unfortunately, the current code doesn’t allow it. The maximum height of an accessory structure (e.g. detached garage) is 12’. This limitation is designed to create a low-rise suburban feel to the neighborhoods. Unfortunately, it has prevented many homeowners from creating second units in the logical and space-saving spot above a garage, even though some of their neighbors already have units above their garages that were built before the rule books were written. Also in the example below, you’ll see another frequent hang up: rear yard coverage. This provision limits the square footage of a structure that can be placed in the rear yard. This is a challenge for property owners because they often want to place their new garage, shop, or second unit in the far rear of the property to maximize the usable space in their backyard. In practice, this provision often means that homeowners have to settle for a wasteful layout. It is staff’s understanding that this provision was originally intended to keep backyards (mostly) free of structures to maintain a suburban aesthetic. A lot of people with corner lots want to build their garages close to the side street to maximize backyard space (which is notoriously limited on corner lots). The current code doesn’t allow it because all driveways must be at least 20’ long. However, there are numerous examples around town which most people wouldn’t find offensive. That title is a little misleading – you can almost always legally park in your own driveway. However, the current code won’t allow us to count your driveway parking spaces towards the two off-street parking spaces that your home is supposed to have if they are located in a front or street-facing setback area. Per our current development standards, the home in the picture below only has two off-street parking spaces (inside the garage). In all residential zones, the minimum front yard setback is 15’ (measured from the front property line AKA Right-of-Way). On almost all streets in Eureka, the front property line lies 12’-in from the face of the curb. It’s a spot that is usually about 6’ into your lawn, and not at the back of the sidewalk where most folks assume it is. In the pictures below, you’ll see examples of homes in Eureka which do not meet this minimum setback. It begs some questions: What is an appropriate front yard setback? Are large setbacks better than short setbacks? Would any single number work for all of Eureka? Do you find yourself despairing at our predicament? Of course you don’t. Are you mildly irritated by the seemingly nonsensical limitations imposed by these development standards? Well, that’s enough for us! 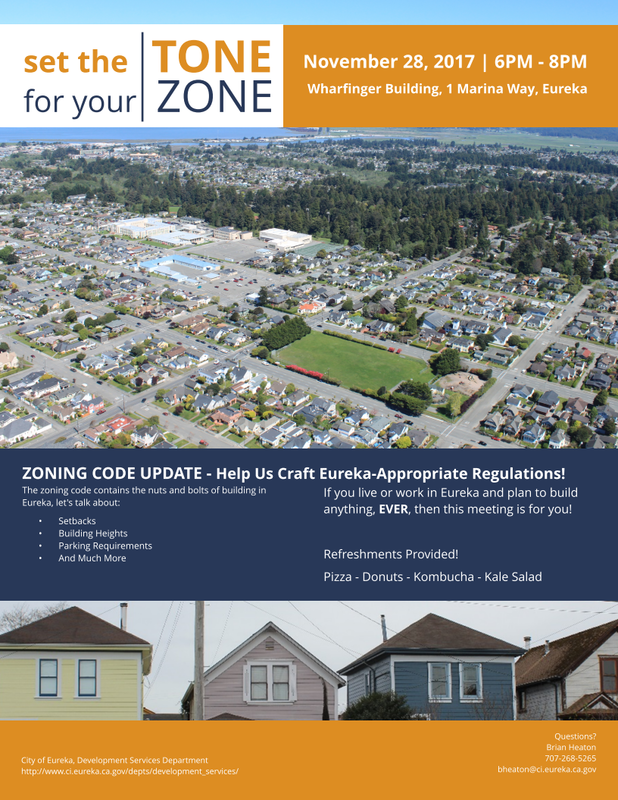 At this exact moment the City of Eureka is in the process of a complete overhaul of the zoning code. From general concepts down to the micro-level details, we are looking at all of the ways that Eureka-appropriate development standards can be used to maintain our architecturally rich community. By focusing on adopting development standards based on local historical development patterns, new infill development can happen in such a way that the character of existing neighborhoods is preserved while still allowing property owners to invest in their properties. If you would like to learn more about the proposed changes, or would like to offer your thoughts, please consider attending the public workshop described in the flyer inside this link, and on this Facebook event page. When: November 28th @ 6-8 p.m. Think you’ll have trouble remembering to come? Send an email to bheaton@ci.eureka.ca.gov and I’ll send you a reminder email a couple days before the workshop.